If you want to eat ceviche, and find yourself in the Mexican city of Culiacan, Los Arcos restaurant is the place to head for. But the recommendation comes with a health warning. There is a story that is heard around Culiacan often enough for there to be at least some truth to it. It is said that on occasion the richest and possibly most powerful drugs lord here chooses to dine in Los Arcos. Twenty minutes before "El Chapo" arrives, the waiters go around collecting the customers' mobile phones. They are told to stay in their seats and are not allowed to leave. Then "El Chapo" arrives (perhaps for the ceviche - a dish of raw fish marinated with lime and chillies), dines, and finally pays for the entire restaurant - to make up for the inconvenience. Twenty minutes after he's left, you'll get your phone back, and - if you need to - finally be allowed to leave your table and go to the loo. Talk to people here about the "narcos" - as those involved in the drugs trade are known - and most will tell you that Joaquin "El Chapo" (Shorty) Guzman is in charge of this city, and much of the surrounding state of Sinaloa. Mexico's drugs problem is growing, and not for want of trying by the federal government. Three and a half years ago, Felipe Calderon was sworn in as president and immediately declared "war" (his word) on drugs. Since then, about 23,000 people have been killed in drug-related violence, and a majority of Mexicans - according to surveys - believe their president is losing that war. That is despite the huge number of federal forces sent into the cities where the cartels are operating. It is despite the social programmes set up to try to combat the poverty that encourages many to enter the lucrative drugs trade. And it is despite the eradication attempts the military here carry out almost every day. 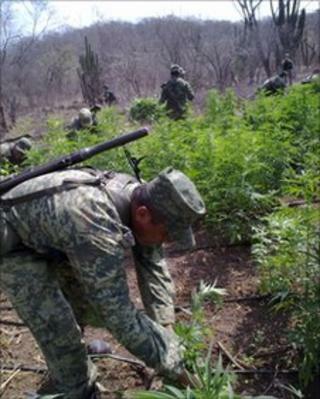 In a small field, half an hour by military helicopter from Culiacan, soldiers are uprooting bright green marijuana plants from the soil. They toss them on to a fire. The sweet smell of the drug wafts across on the breeze. The soldiers giggle that they sometimes get the "munchies", as some smokers call the hunger-inducing effects of cannabis. What is not funny though, for Col Augustin Reyna Mendoza and his men, is that their efforts to eradicate marijuana will come to nothing. "It's one of the main things people do here," the colonel says. "One of the main sources of income for them. It's a way of life. So it's a cycle. They grow and we destroy it. Grow and destroy." In two months' time, they predict, there will be another field of the drug growing here. The army hierarchy insists its eradication efforts are bearing fruit. So far this year in this area they say they have destroyed exactly 28,321 marijuana plants and a total of 10,466 poppy plants. In a warehouse, soldiers display plastic cool-boxes full of the acrid semi-liquid/semi-solid chemical mixture that would be sold on the streets as crystal-meth. Plastic buckets hold $17m (£11.7m) worth of opium. Here, too, the smell is somewhat overwhelming. Such seizures, though welcome, represent just a tiny part of the multi-billion dollar drug industry. Tackling that industry is proving to be very difficult indeed. "As the government itself has said, the drug cartels are probably more powerful than anybody thought," says Jorge Castaneda, a former foreign minister. On the bookshelves in his living room in Mexico City stand photos of him with the likes of Hillary Clinton, George W Bush and others. As far as Mr Castaneda is concerned, the president's self-titled war on the cartels is ill-conceived. "The issue is really to determine whether you want to take them on at the same time, and in all of their activities," he says. "What is it you're after, what kind of a war is this? And that's never been clear in the government's mind and certainly hasn't been made clear to Mexican society.'" So far, the war has been fought by pumping troops and police into cities like Juarez, which sits on the main smuggling route into the United States. It could be seen as a "shock and awe" attempt by the president to bring down the murder rate. It has - officials say - forced the drug cartels to find other smuggling routes. Even so, the mayor of Juarez, Jose Reyes Ferriz, still uses a heavily armoured vehicle. More than 1,000 people have been killed in drugs-related violence in this - Mexico's murder capital - this year alone. "We've already lost a generation. About 60 to 70% of those being killed right now are between 14 and 24 years old," Mayor Ferriz says. The reason, says Mr Ferriz, is "all social". Unemployment has been rising. Assassins are paid $45 a week by the local drug gangs, he says, "not to become rich, simply to put food on the table". The Mexican government insists its approach is working, and that programmes to curtail corruption among the police and army are working. But there seems to be a growing realisation here that perhaps defeating the drug cartels is too ambitious a goal. Mr Ferriz says the approach in Juarez is simple: try to move the cartels elsewhere, to other cities in Mexico, even outside the country. Make it someone else's problem. And he has a warning. "If Mexico is successful in moving the flow of drugs, especially cocaine, into the US, into other countries, it's going to affect many small countries, like Guatemala, El Salvador, Honduras, Costa Rica, who don't have the economics of Mexico and are very likely not going to be successful in stopping the flow of drugs through their places."